I had seen it numerous times. On the net, in newspapers, on other blogs, on tastespotting and other food display sites. But never at my local vegetable market or for that matter in a supermarket too. So, when the most-health-conscious-paleo-obsessed-organic-freak friend of my husband dropped a bunch at our place, I was surprised. And Happy. Kale Leaves. The wonder plant. Recently crowned as ‘Queen of Greens’, this gorgeous green is a nutritional powerhouse. Glorifying the innumerable benefits, we love Kale as it is low in calorie, high in fiber and has zero fat. 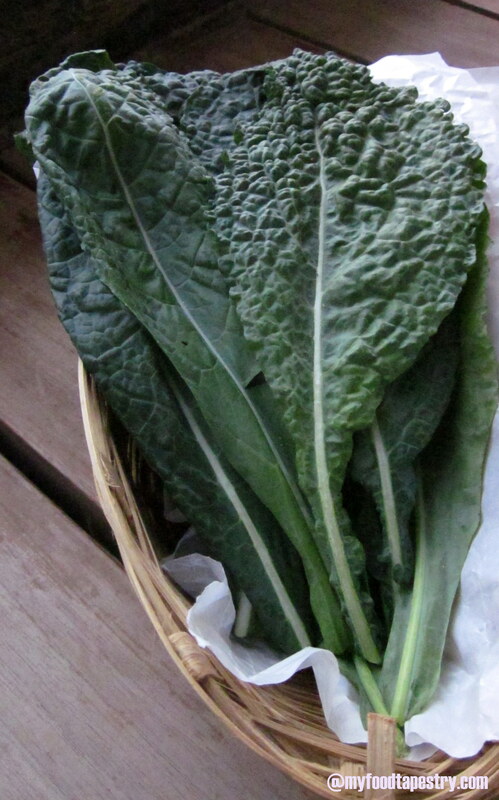 It is high in Vitamin K, A and C and filled with powerful antioxidants. Being a fabulous anti-inflammatory food, it is also great for cardiovascular support. Can you believe, per calorie kale has more iron than beef and more calcium than milk! Yea. It rendered me speechless too. Dishing out a very Indian Daal/Lentil Stew and a more sophisticated salad was a breeze. You treat it as how you would treat any other green like spinach, fenugreek or amaranth. It is happy to be sautéed, baked or slow-cooked in a soup or stew, all of which break down its slightly bitter, tough exterior. But kale can also be cajoled into a surprisingly delightful exquisite salad, it just needs a little hands-on tender love to turn it from sturdy to silky. So, when eating raw, you massage the leaves gently to ensure maximum flavour and right texture. 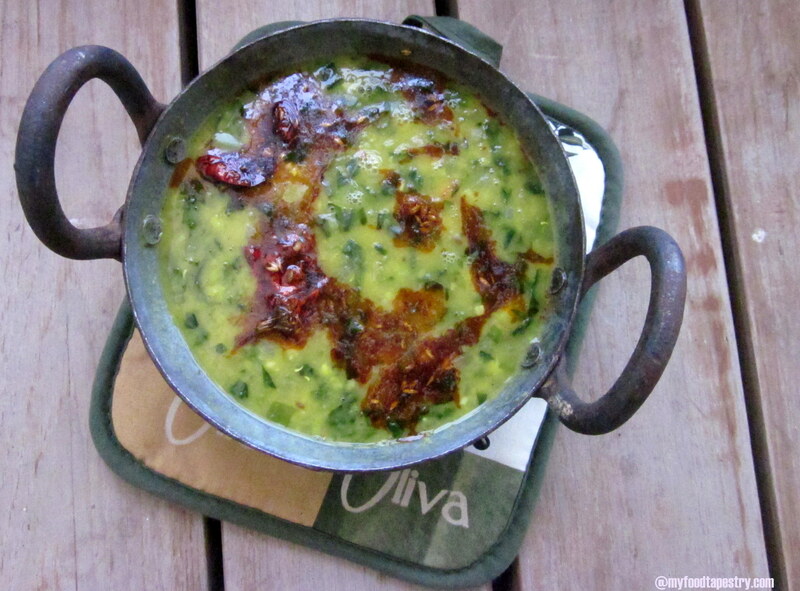 I made this in a south Indian style daal/stew, to be eaten with hot steaming rice and some poriyal/kootu. Chopped coriander leaves to garnish. I used a pressure cooker to boil the lentil. You could do that in a pot too. In the cooker, add soaked toor dal, salt, turmeric, 2 cloves of garlic and little ginger, one green chili and chopped tomato. Whistle for 3-4 counts. Now, in a wok, heat 1 tbsp ghee. Crackle cumin and mustard seeds. Throw in the shallots, rest of the garlic, ginger and green chili. Saute till the onions turn pinkish brown. Now, throw in the chopped kale leaves. Sprinkle little salt. Mix well and cook till the leaves are almost done. Takes about 3-4 minutes. Now add the boiled dal. Mix well. give it a boil or two. Just before serving, heat another tbsp of ghee, throw in the dried red chili and red chili powder, immediately switch the flame off. This tempering is now poured over the ready daal. Garnish with chopped coriander leaves. 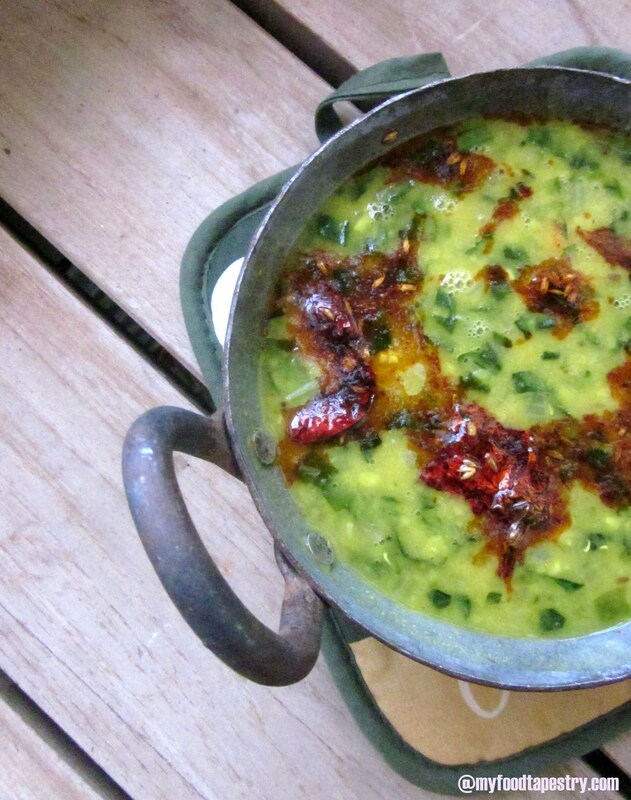 Serve hot with rice or chappathis. 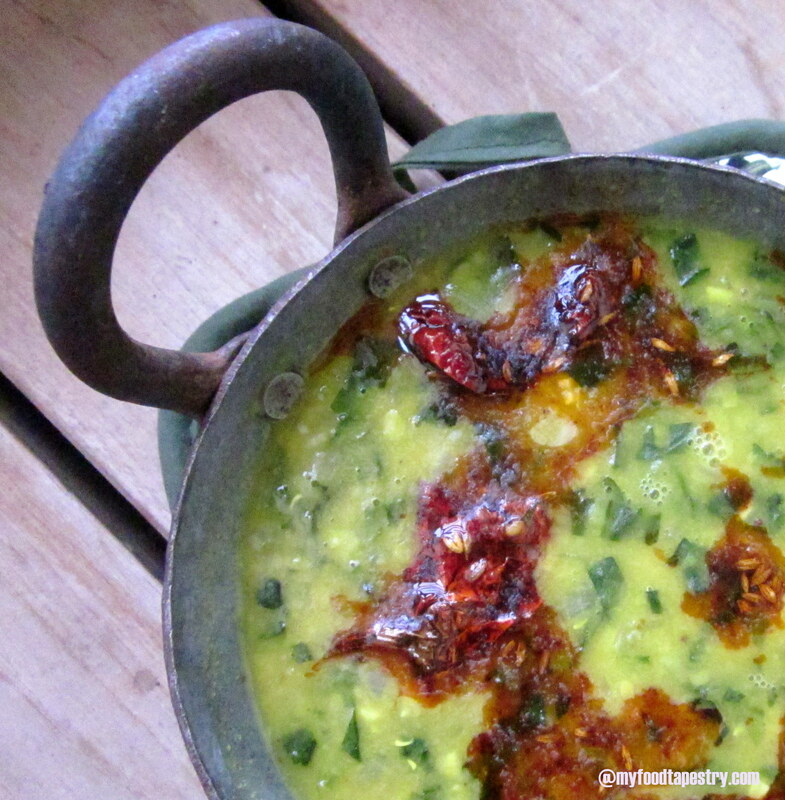 If you would like to enjoy the dal as a soup, cut down the green chilies and ignore the red chili powder. What you then get is a bowl full of lentil-kale highly nutritious soup! 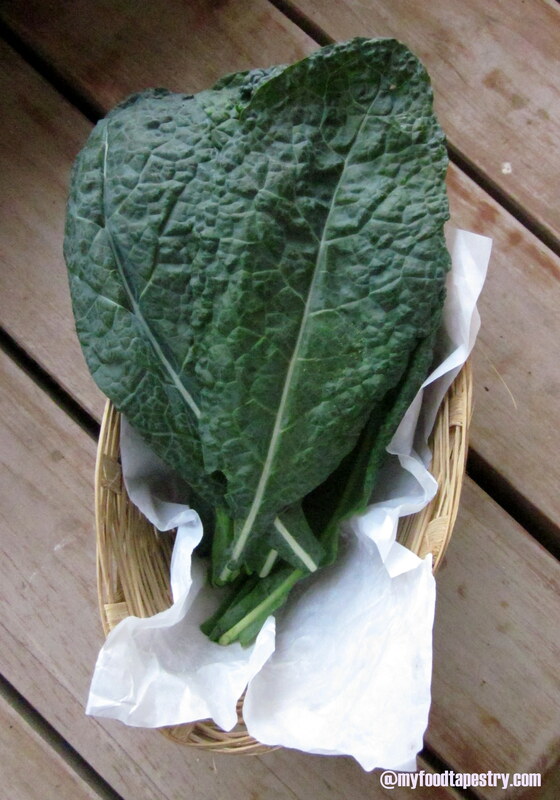 Place your washed chopped kale leaves in a big bowl. In a small bowl, combine garlic, pepper, salt, lemon juice, olive oil and honey. Mix well to combine and then pour over the kale. Massage the leaves gently for 3-4 minutes, until the leaves start to soften and wilt, and no longer tastes bitter when you try it. 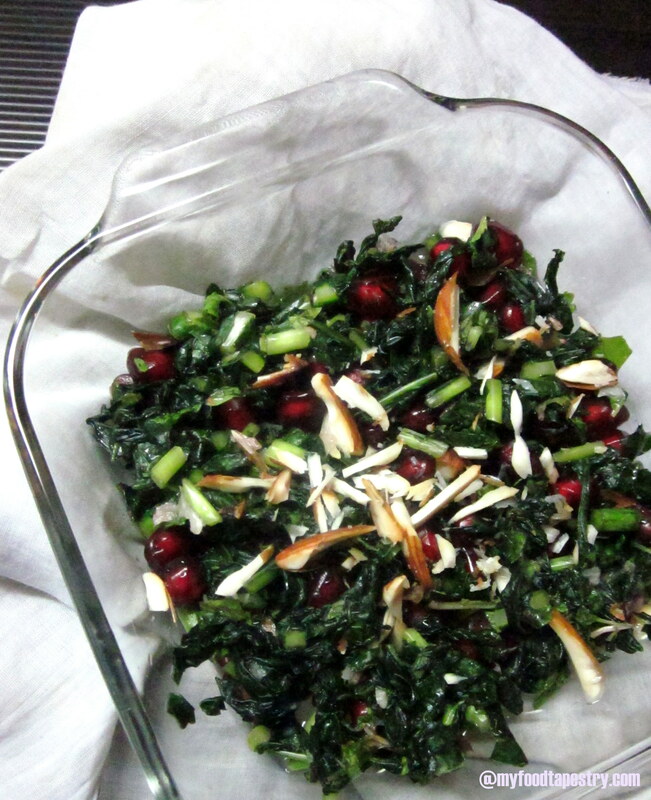 Sprinkle mint, seeds, pomegranate, cranberries and almonds over the top of the kale and serve. Note: don’t omit the almonds! They add such crunch to the salad, you will be surprised. 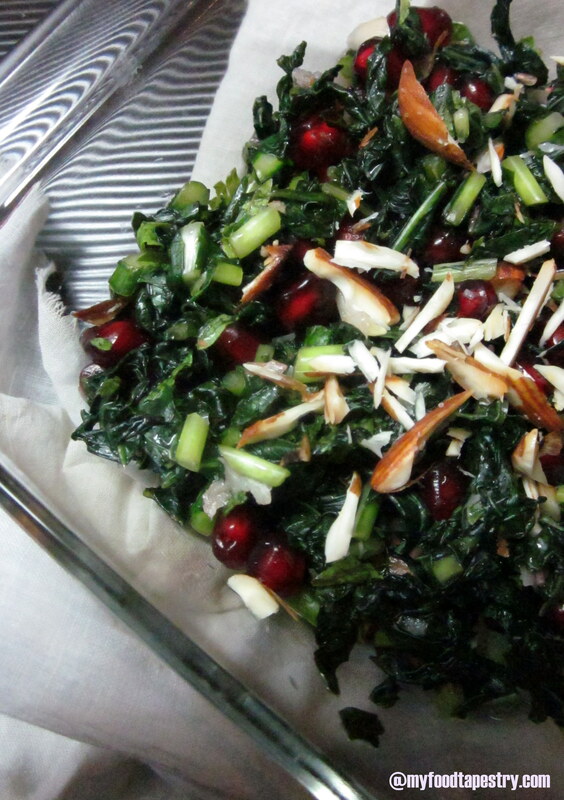 Note: I omitted the cranberries and seeds, because I didn’t have any in hand, still the salad tasted great. Note: Play around with the ingredients, throw in what you have, omit what you don’t. And if you have more ideas, do drop a line. For those who live in India, you can buy Kale Leaves from the innumerable stores of Godrej’s Nature Basket.